Five Fiji ferries were damaged by the tropical storm Winston, causing communication and environment problems for the inner islands of the archipelago. Two ferries Spirit of Altruism and Spirit of Love broke their moorings and grounded off Natovi, while Westerland grounded off Balaga Bay in Savusavu. The two other vessels Sinu-iwasa and Sinu-i-wasa Tolu capsized on the berth and partially sank. 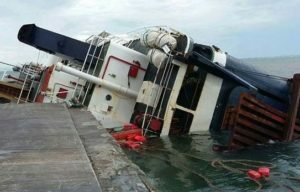 Fortunately during the accidents there were no people on board of the ferries, but the capsized and grounded ships has sufficient fuel on board, which might spill and cause environment disaster. The local authorities are considering salvage operations and monitoring the areas around troubled vessels. The tropical storm Winston caused sufficient damages for Fiji’s infrastructure and communications. The damaged ferries fleet disturb transportation between the archipelago’s islands. The ferry Spirit of Altruism (IMO: 7215290) has overall length of 74.00 m, moulded beam of 17.00 m and maximum draft of 3.50 m. The deadweight of the vessel is 726 DWT and the gross tonnage is 3,474 GRT. The ship is owned and operated by Patterson Brothers Shipping Limited. The ro-ro ferry was built in 1972 by Danyard Allborg shipyard in Denmark. The ferry Spirit of Love (IMO: 9232357) has overall length of 73.00 m, moulded beam of 15.00 m and maximumd raft of 3.20 m. The deadweight of the vessel is 1,000 DWT and the gross tonnage is 2,305 GRT. The ro-ro ferry was built in 2001 by Greenbay Marine Technologies shipyard in Singapore. The operator of the ship is Patterson Brothers Shipping Limited. The ferry Sinu-iwasa (IMO: 7206031) has overall length of 63.00 m, beam of 12.00 m and maximum draft of 3.50 m. The deadweight of the ship is 1,053 DWT and the gross tonnage is 1,481 GRT. The passenger Ro-Ro vessel was built in 1972 by Nqea Australia shipyard. The owner and operator of the ship is Venu Shipping. The ferry Sinu-i-wasa Tolu (IMO: 5423661) has overall length of 65.00 m, moulded beam of 17.00 m and maximum draft of 4.00 m. The deadweight of the ship is 500 DWT and the gross tonnage is 1,721 GRT. The passenger vessel was built in 1964 by Oresundvarvet in Sweden. The owner and operator of the ship is Venu Shipping. The passenger Ro-Ro vessel Westerland (IMO: 7041091) has overall length of 58.00 m, moulded beam of 12.00 m and maximum draft of 3.00 m. The deadweight of the ship is 356 DWT and the gross tonnage is 1,509 GRT. The ship was built in 1971 by Husumer Dock and Reparatur in Germany. The manager of the ferry is Bligh Water Shipping Limited.